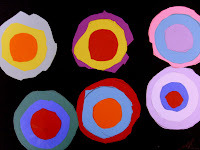 Deep Space Sparkle Art Lessons for Kids: Kindergarteners do Kandinsky! I discovered this lesson over at the Artsonia website. Camelback Desert School in Arizona provided the original lesson of which I altered very little. The kids are literally tracing, cutting and gluing. There is nothing else involved and what good practice it is. Hand out a sheet of black construction paper. Tip: If you have only a little time to do this project, consider making the paper size small than the regular 12" x 18". It'll go much faster and the effect will be the same. Despite the lesson being quite easy, the set-up requires a bit of time. Every student needs a glue stick, pair of scissors & pencil. Easy. But to reduce the amount of paper waste with this project(we all know that the kids will cut the tiniest circle from the middle of the largest piece of paper), you'll need to provide paper in stages. Here's what I did: Give each student a plastic container with a 5" diameter (yoghurt, salsa, sour cream containers), then have them trace and cut out 6 circles. Provide paper that is just the size for the container. Glue the cicrcles onto the black paper. Next step: Do the same but use a small plastic cup and smaller pieces of paper. 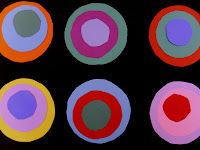 Have them cut out 6 medium sized circles. 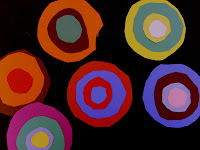 Glue the medium circles to the large circles. Tip: talk about contrasting colors or else you'll have the yellow medium circles glued to yellow large circles. I suspect for this age it's all about matching things up! 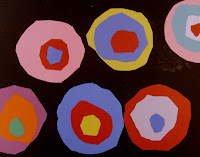 Repeat steps, but this time, the kids can use the scraps of paper from steps one and two to make smaller and smaller circles. Thanks so much for this site. It is one of my many favorites now. Feel free to visit mine as well and use whatever ideas you can. I can't wait to try some of these with my students. Thanks Julie. I'm just discovering more and more great sites (including yours) for kid's art, but I still don't think there are enough of us! Hey...I noticed that you are a writer as well. So am I.
Wow! I love how colorful these are! Great idea! LOVE this Kaninsky project- so pretty!!! You'll need two of your 35 minute classes. that's all I had and it worked out. thanks again, and I wanted to tell you about an art supply that isn't on your supply list and that you might not know about. Have you used Crayola's "construction paper crayons"? As far as crayons go, they are pretty great. All of the colors show up, even on dark colors of paper. Just thought I'd mention it, because they are so easy and the kids really like them! I have construction paper crayons and hardly ever sue them. Why, I have no idea. Thanks for the tip...I'm going to get them out of the cupboard! Great project, but I made a few changes. I teach Art grades pre-K -5. I have aprox. 85 Kindergarten students. This is a LOT of prep work for that many students and a LOT of paper. I changed the size down to 9"x12" and instead of circles we just used the squares that I had already cut. I have one 40 minute block with them a week. My K students had trouble just using a glue stick, here at the beging of school, so I did not want to incorporate too many steps (tracing, cutting) that would limit their progress. We put 4 large squares on our paper, one in each corner and then went down in size as the lesson shows. At the end students put one square in the center and did the same thing. They looked great and we managed to finish in one class period.